This is a luxury 2 bedroom, 2 bathroom south facing, ground floor apartment on the five star Roda Golf and Beach Resort. With marble floors throughout, the apartment is fully air-conditioned with central heating. The stylishly furnished living and dining area, includes a 32 inch LCD TV with English channels and a DVD/CD player. The master bedroom with ample wardrobe space, has access to the sun terrace of 25sq.m and en-suite facilities and can be presented as one super king or alternatively a twin bedded room. In addition the second bedroom, being twin is situated next door to the shower room. A double sofa bed is also available in the living area. There is a fully equipped kitchen with oven, halogen hob, microwave/grill, fridge/freezer, washing machine etc. The south facing terrace overlooking the communal swimming pool is equipped with table, chairs and recliners. Wifi is also available. En-suite bathroom to bedroom 1 with bath, shower, wc. Shower room, wc. Stylishly furnished living/dining area with 32" LCD TV including satellite channels, DVD/CD player, ipod/phone docking station. Double sofa bed in living area. Dining table seats 4 but can be extended to seat 6. Oven, halogen hob, microwave/grill, fridge/freezer, washing machine, toaster, kettle. The 18 hole par 72, Dave Thomas designed course is managed by the prestigious De Vere Group and is the first PGA academy in mainland Europe and the first golf course in the area to attain the ISO 14001 environment award. The golf course is fully operational with practice range, putting green and a club house with restaurant and bar. There are also many facilities available for those wishing to improve their game including simulators, computer assisted learning equipment for analysing and improving all aspects of your game in addition to fully qualified PGA instructors. The apartment is wheelchair friendly, being ground floor, with ramp to front entrance. Lift access from underground car park. Notes on accommodation: The apartment is fully air-conditioned and also has the benefit of central heating. The resort provides children's play areas, swings, climbing frames etc. In addition there are Tennis/Paddle Tennis/Basketball, 5 aside football facilities & on site Mini Market for all your essential needs. Outside: The 25sq.m south facing sun terrace is furnished with table, chairs and sun loungers just a few steps away from the shared pool and gardens. Cleaning / Towels / Linen / Maid service: Towels and linen are provided. For stays of 2 weeks or more, a mid stay clean is recommended (payable locally) and will include fresh linen and towels. 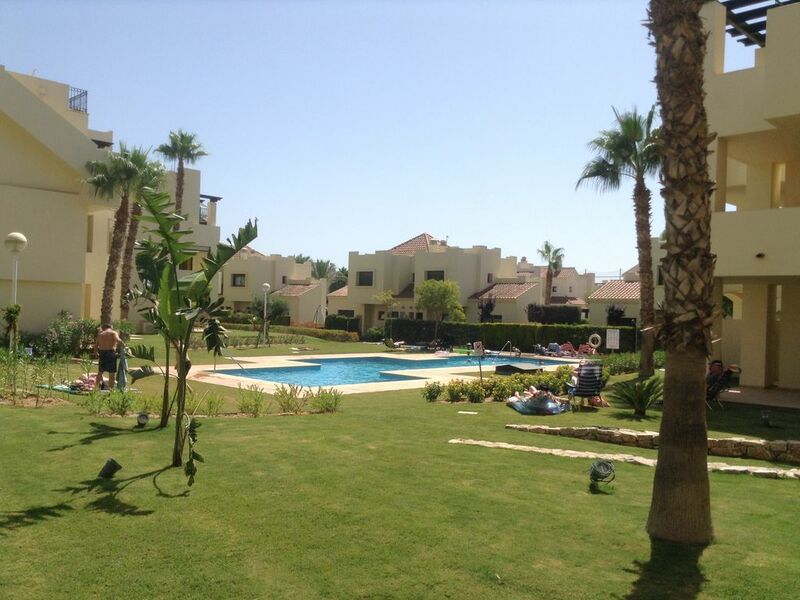 We had a lovely time on Roda - good apartment, by the pool, ideal location and great for the driving range. The complex is close to shops, bars and restaurants, and five minutes’ drive to the nearest beach. Fantastic beaches are easy to get to, but a car is recommended. Thankyou for the positive feedback. So pleased you enjoyed your stay at the apartment and also the resort. Hope to welcome you back again in the future. Situated 5 minutes drive or a 25 minute leisurely walk (from the front entrance), is the Mar Menor, the largest seawater lagoon in Europe with promenades stretching for 8km and superb beaches with Q awards for excellence and safety. Nearest airport is San Javier (8 minutes by car). Alicante airport is a 50 minute drive away. Car hire, whilst not essential, is recommended. The typically Spanish town of Los Alcazares within a 5 minute drive has an abundance of quality restaurants and bars. Places of interest include Murcia City within a 40 minute drive and Cartagena within a 25 minute drive for both history and excellent shopping and Lo Pagan within a 10 minute drive famous for its mud baths. Booking Notes: 25% deposit required within 7 days of reservation. Final payment 56 days before stay, £150 breakage deposit to be paid with final balance, returnable within 7 days of completion of stay. Compulsory charge of €75 for meet & greet,cleaning/linen etc is payable locally. In addition to the €75 end of stay clean fee there is a €10 charge for arrivals after 22:00 hrs, also, should the sofa bed be required a further charge of €10 is also payable locally to the property managers. Changeover Day: Preferred changeover day is Saturday, however this can be flexible. The apartment will be accessible from 4pm on arrival day and we ask that it is vacated by 11am on day of departure, however when possible we will try to be flexible on these times.